Europe is the world's sixth largest continent. Together with its adjacent islands, it occupies an area of about 4,000,000 square miles (10,360,000 square kilometers), roughly 8 percent of the world's land area. 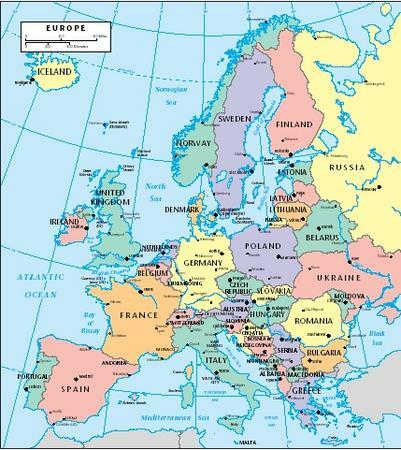 Geographically, Europe can be seen as a peninsula of the single great continent called Eurasia (Europe and Asia combined). However, because Europe has such a distinctive history and culture, it is considered a separate continent. The boundaries of the European continent are recognized as the Ural Mountains and the Ural River in the east; the Caspian Sea and the Caucasus Mountains in the southeast; and the Black Sea and the Bosporus and Dardenelle Straits in the south. The Mediterranean Sea and the Strait of Gibraltar separate Europe from the African continent, while the Atlantic Ocean borders it in the west and the Arctic Ocean borders it in the north. Numerous islands around the continental landmass are considered to be a part of Europe. More than 40 independent counties lie within the boundaries of the European continent. The highest point on the continent is Mount Elbrus in the Caucasus Mountains, which rises 18,481 feet (5,633 meters) above sea level. The lowest point occurs at the surface of the Caspian Sea, 92 feet (28 meters) below sea level. Europe's longest river is the Volga, which runs for almost 2,300 miles (3,700 kilometers) in central and western Russia before emptying into the Caspian Sea. It drains an area of about 533,000 square miles (1,380,470 square kilometers). Europe's second longest river, the Danube, runs through the heart of the continent. About 1,770 miles (2,850 kilometers) long, it drains an area of roughly 320,000 square miles (828,800 square kilometers). A third prominent river is the Rhine, which winds through west-central Europe for 820 miles (1,320 kilometers) before emptying into the North Sea. Other chief European rivers include the Elbe in central Europe; the Dnieper and Don in Russia; the Garonne, Loire, and Rhône in France; the Tagus in Spain; and the Oder and Vistula in Poland. The Caspian Sea, with an area of 143,550 square miles (371,795 square kilometers), is the largest inland body of water in the world. The largest lake within the boundaries of Europe proper is Russia's Lake Ladoga, which covers approximately 7,000 square miles (18,100 square kilometers). Other large European lakes include Geneva and Zurich in Switzerland; Constance on the border of Switzerland, Germany, and Austria; Balaton in Hungary; Como, Garda, and Maggiore in Italy; and Vättern and Vänern in Sweden. Europe may be divided geographically into four physical regions: the Northwestern Uplands, the Central Plain, the Central Uplands, and the Alpine mountain chain. Bedrock: Solid rock lying beneath the soil on the surface of Earth. Bog: Area of wet, spongy ground consisting of decayed plant matter. Fjord: Long, narrow, steep-sided inlet of the sea. Glacier: Large mass of ice slowly moving over a mountain or through a valley. Moor: Broad stretch of open land, often with boggy areas. Moraine: Mass of boulders, stones, and other rock debris carried along and deposited by a glacier. Northwestern Uplands. Uplands—high plateaus, rugged mountains, and deep valleys—stretch along Europe's northwest coast from western France through the United Kingdom to the Scandinavian peninsula. Farming in this area is often difficult because of the rocky soil, and the climate is often rainy. Moors and bogs (areas of wet spongy ground) dominate in the northern sections. During the last Ice Age, which ended about 11,000 years ago, glacial ice covered much of the far northern areas. When the ice retreated, it left deep valleys along the shores into which ocean water flowed. These narrow arms of the sea—called fjords—reach far inland and are bordered by steep mountains. Central Plain. The most densely settled part of Europe, with its largest cities and manufacturing sites, is the Central Plain. Starting at the Atlantic coast of France, it spreads out in a V-shape, growing wider as it extends west. At the Ural Mountains, it stretches from the Arctic Ocean to the Black Sea. Except for being perfectly flat in the Netherlands, the plain features occasional hills and isolated ridges. Much of the plain holds fertile agricultural soil. Around the Baltic Sea, Ice Age glaciers left mounds of boulders, stones, and other rock debris they had carried along. These remaining hills, called terminal moraines, mark the leading edge of these glaciers. Glaciers subject earth materials beneath them to the most intense kind of scraping and scouring. An alpine glacier has the power to tear bedrock (solid rock beneath soil) apart and move the shattered pieces miles away. These are the forces that shaped the sharp mountain peaks and U-shaped mountain valleys of modern Europe. Many European mountain ranges bear obvious scars from alpine glaciation, and the flat areas of the continent show the features of a formerly glaciated plain. Central Uplands. Between the Central Plain and the Alpine mountains lies a band of uplands. It stretches from Spain's Atlantic coast through France and Germany to Poland. Important mountainous and wooded plateaus in this band include the Meseta (in Spain), the Massif Central (in France), the Ardennes (across Belgium, Luxembourg, and France), the Black Forest (in Germany), and the Bohemian Forest (along the northern Czech-German border). Alpine mountain chain. Southern Europe from Spain to the southern part of western Russia is dominated by the Alpine mountain chain. Beginning at the western edge, the mountains forming this chain are the Sierra Nevada range in Spain, the Pyrenees between Spain and France, the Alps in south-central Europe, and the Apennines in Italy. The Sierra Nevada range in southern Spain runs parallel to the Mediterranean Sea for about 60 miles (100 kilometers). The highest peak in the range is Mulhacén, which rises to a height of 11,411 feet (3,478 meters). The Pyrenees form an effective barrier between the Iberian Peninsula (on which Portugal and Spain lie) and the rest of Europe. They extend 270 miles (435 kilometers) in an almost straight line from the Bay of Biscay on the west to the Gulf of Lions on the east. The highest peak in the Pyrenees is Pico de Aneto, 11,168 feet (3,404 meters) above sea level. 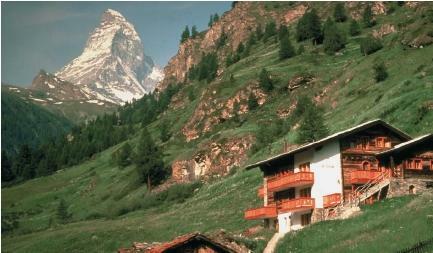 The Alps are Europe's great mountain system. They stretch in an arc for almost 660 miles (1,060 kilometers) from the Mediterranean coast between France and Italy into Switzerland and along the northern boundary of Italy, through southwest Austria, before ending in Slovenia. The Alps, composed of more than 15 principal mountain ranges (all of which have offshoot ranges), cover an estimated 80,000 square miles (207,200 square kilometers). They form a barrier between southern Europe and western and central Europe. The highest peak in the Alps is Mont Blanc, 15,771 feet (4,807 meters) in height. Many peaks in the Alps rise above the snowline, 8,000 to 10,000 feet (2,440 to 3,050 meters), and thus are permanently snowcapped. mountain system are marked by crater lakes and volcanoes. Two of those volcanoes—Vesuvius and Etna—are still active. It was Vesuvius that erupted on August 24, A.D. 79, burying the cities of Pompeii and Herculaneum. The Caucasus Mountains, extending for about 750 miles (1,210 kilometers), act as a divide between Europe and the Middle East. The mountain system is volcanic in origin, and many of its peaks rise above 15,000 feet (4,600 kilometers). Included in this group is Mount Elbrus, Europe's highest mountain. Lying northeast of the Caucasus are the Ural Mountains, the far eastern boundary of Europe. Unlike the Caucasus, the Urals do not form an almost impassable wall. They are low and covered with forests. The Urals, extending about 1,500 miles (2,400 kilometers) from the Arctic tundra to the deserts near the Caspian Sea, average only 3,000 to 4,000 feet (900 to 1,200 meters) in height. The highest peak in the range is Mount Narodnaya, which rises 6,214 feet (1,894 meters) above sea level. Europe continues to change today. From the Atlantic coast of the Iberian Peninsula to the Caucasus, Europe's southern border is geologically active. It will remain so effectively forever. Africa, Arabia, and the Iranian Plateau all continue to move northward, which will insure continued mountain-building in southern Europe. Geologists are concerned about volcanic hazards, particularly under the Bay of Naples and in the Caucasus. Smaller earthquakes, floods, and other natural disasters happen almost every year. In historic times, entire European cities have been devastated or destroyed by volcanos, earthquakes, and seismic sea waves. These larger-scale natural disasters can and will continue to happen in Europe on an unpredictable schedule. thanx this site helped me alot and i will give half of my test scors to you people how made this web page. this site helped me alot now i will get an A in social studies..! Presented information helped me to write my project, thanks!